Freshwater habitats—and transition zones to saltwater such as deltas and tidal marshes—provide key habitat for growth of baby salmon. This habitat is threatened by human development. There is no single approach to salmon restoration. The habitat needs for one group of juvenile salmon might not be the same for another. Scientists emphasize the importance of restoration strategies based on the specific life history of the population. 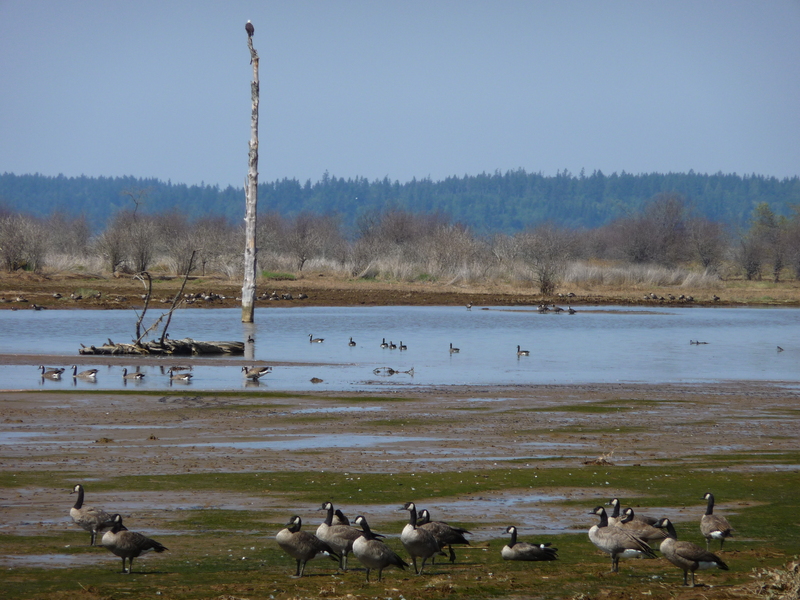 Collaboration and coordination can help scientists tackle larger efforts such as the Nisqually Delta restoration. After a long day pulling nets out on the Nisqually Delta, biologist Aaron David clambers ashore, waders askew. What he’s lugging up onto the bank—two 5-gallon buckets that are full of water and alive with palm-length juvenile Chinook salmon—might hold the answers to one of the region’s most pressing environmental questions: Are efforts to recover Salish Sea salmon working? David, a scientist with University of Washington’s Wetland Ecosystem Team, is one of a small army of restoration ecologists who are monitoring 862 acres of the Nisqually Delta that are coming back to life, transformed from farmland back to tidal marsh by the breach of several agricultural dikes in 2006 and 2009. David plans to take the diminutive salmon back to the lab, remove their stomachs, and sort through the contents to find out what the fish have been eating. 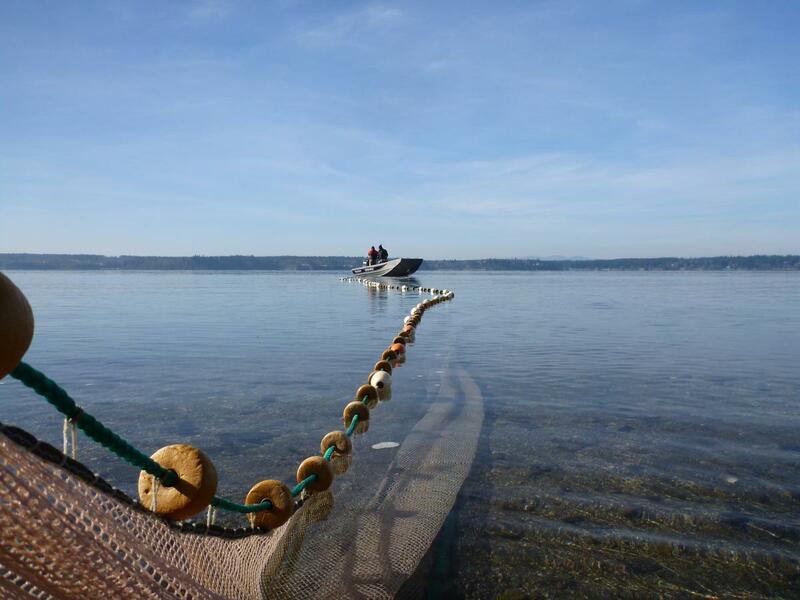 By examining their diets, David hopes to tell if the Nisqually restoration is giving the young Chinook more opportunity to eat and grow before heading out into Puget Sound. One of the major goals of restoration projects like this one is to reopen habitat for salmon during their early life stage (known as rearing), based on the belief that one of the keys to survival is their rapid early growth before they migrate into the open saltwater. Puget Sound Chinook salmon were placed on the Endangered Species List in 1999; Puget Sound steelhead followed in 2007. The region’s coho populations, once considered robust, are currently undergoing a precipitous decline. Since the ESA listings, little tangible progress has been made on increasing threatened salmon numbers, and recovering Puget Sound’s salmon has presented a puzzle as large and complex as the watershed itself. Over their life cycles, salmon are subject to stresses from headwaters to estuary to ocean, creating unique challenges for restoration efforts. Scientists believe that shoring up early growth of salmon in freshwater environments may help recovery efforts. Faced with limited time and money, ecologists and managers around the Salish Sea have started to ask: Are there survival bottlenecks that, if identified and fixed, could turn the tide of salmon recovery in Puget Sound? Traditionally, restoration efforts have focused on spawning habitat, but scientists argue that may no longer be enough. 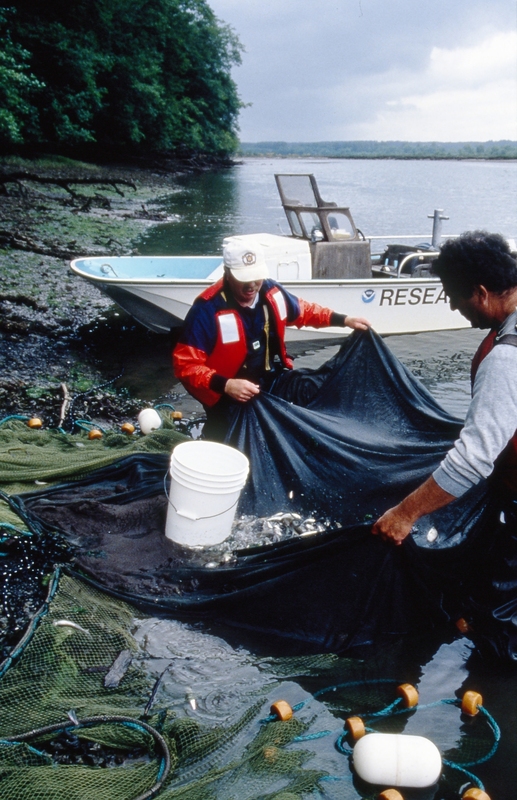 New research presented at the 2014 Salish Sea Ecosystem Conference suggests that, though by no means a silver bullet, conserving and increasing high-quality freshwater rearing habitat could be one of the most effective ways to support salmon recovery in the Salish Sea. Researchers say survival of a young salmon on its journey from an egg in the gravel to a silvery smolt ready to enter Puget Sound pivots on the crucial matter of growth. 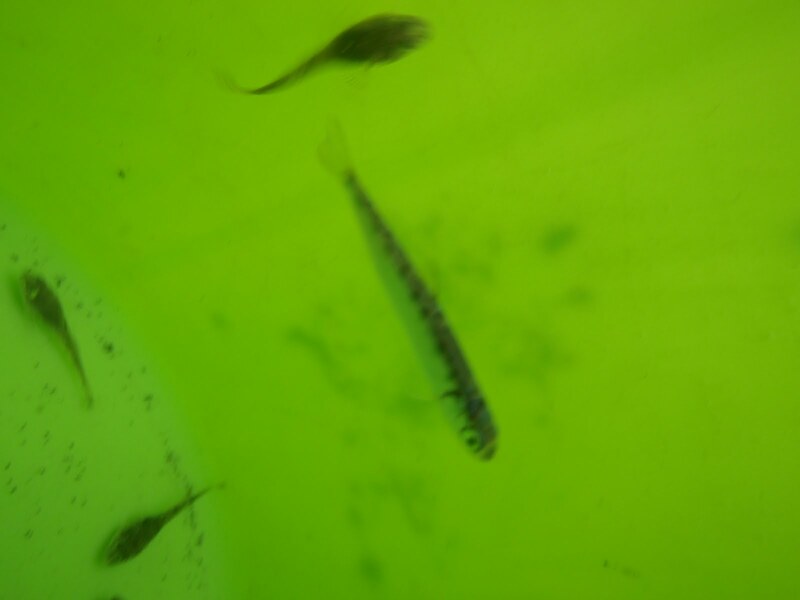 The faster a baby salmon can grow in these early stages, the bigger and healthier it will be; the lower the chance it will be lunch for another fish or bird; the better it can outcompete its siblings for food; and the better its overall chances at making it out into Puget Sound. 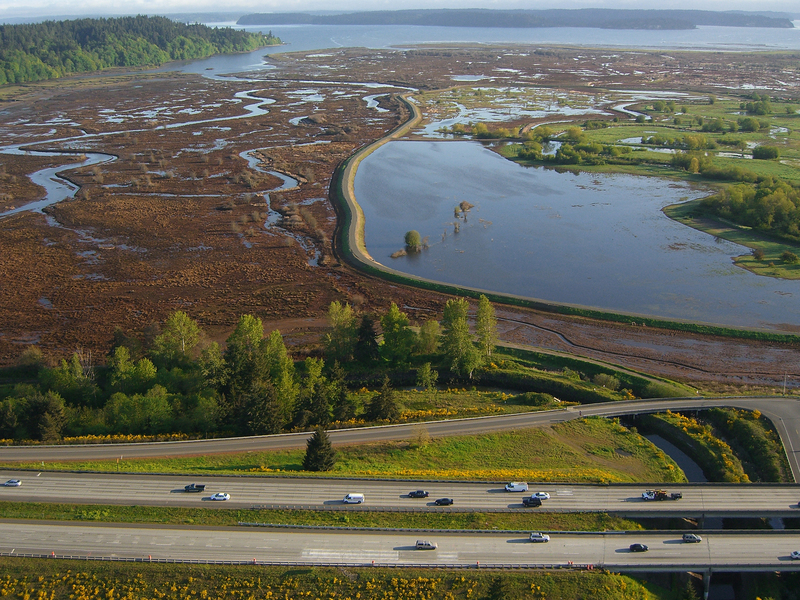 Studies show that floodplains and salt marshes like the Nisqually Delta provide vital habitat for this growth, but the equation gets complicated quickly. Habitat that’s important for one group of juvenile salmon might not be important for another. Within just one river system, different salmon species, or even groups within a species, vary in the timing and location of when and where they spawn, grow and migrate to the Sound. In light of this complexity, how can scientists respond in a coordinated fashion? Several researchers speaking at the conference pointed to a need for more on-the-ground information. Washington Department of Fish and Wildlife scientist Joe Anderson says that a detailed knowledge of life history—the when and where of spawning, growing, and migrating—within individual Puget Sound salmon populations will be central to planning successful recovery strategies. Anderson recently uncovered previously unknown levels of diversity in several populations of Puget Sound Chinook: What biologists previously thought were just one or two types of Chinook turned out to be more, all with unique habitat needs. Those with a stream-type life history showed signs of being food-limited, while those that migrate to the ocean soon after hatching did not. Anderson believes this is a critical finding that identifies a potential bottleneck within a specific life-history type. He concludes that for some populations, rearing habitat for juveniles, and not spawning habitat for adults, is the dominant limiting factor. These results beg the question: Should agencies keep spending money to restore adult spawning habitat? Not if adult spawning habitat isn’t what’s creating the bottleneck in a particular river, says Anderson, because increasing numbers of juveniles competing for a limited amount of resources actually may harm their overall growth and survival. Similar results have been found for other species. In a study of ESA-listed Skagit River steelhead, Jamie Thompson of R2 Resource Consultants was intrigued to find that each Skagit tributary studied had a unique combination of factors—temperature, food availability, and physical habitat—affecting salmon growth in different ways. Stories like these have led many scientists to call for a more complete and wide-ranging accounting of habitat needs. “We need a comprehensive map of Puget Sound[‘s]… potential to support salmon so we can prioritize restoration actions,” says Robert Bilby, a scientist at Weyerhaeuser. Such a map is currently under development through the Puget Sound Partnership in cooperation with Long Live the Kings and other groups, and in 2013 NOAA established a coordinated monitoring framework for Puget Sound Chinook. The University of Washington's Aaron David believes that managers should also coordinate their efforts and “go big.” Given the wide variety of habitat types and pressure points facing salmon, managers run the risk of having their work diluted or fragmented. He argues that small-scale restoration projects might not be as effective without widespread coordination among salmon researchers. That’s one of the philosophies behind the Nisqually restoration project. 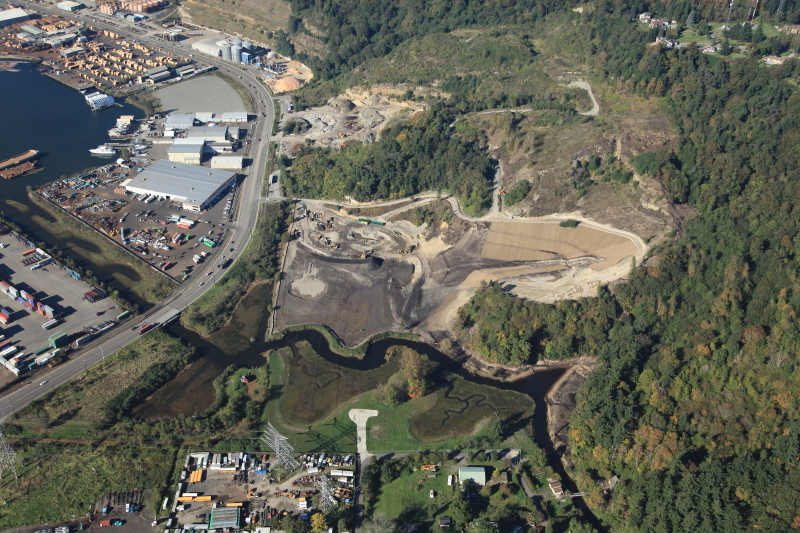 It is the largest project of its kind ever to be attempted in the Pacific Northwest, and is led by multiple collaborators including the Nisqually Tribe, the U.S. Geological Survey, Ducks Unlimited and the U.S. Fish and Wildlife Service. Over a period of just a few years, the areas under restoration are approaching the function and quality of a nearby, never-diked reference marsh. 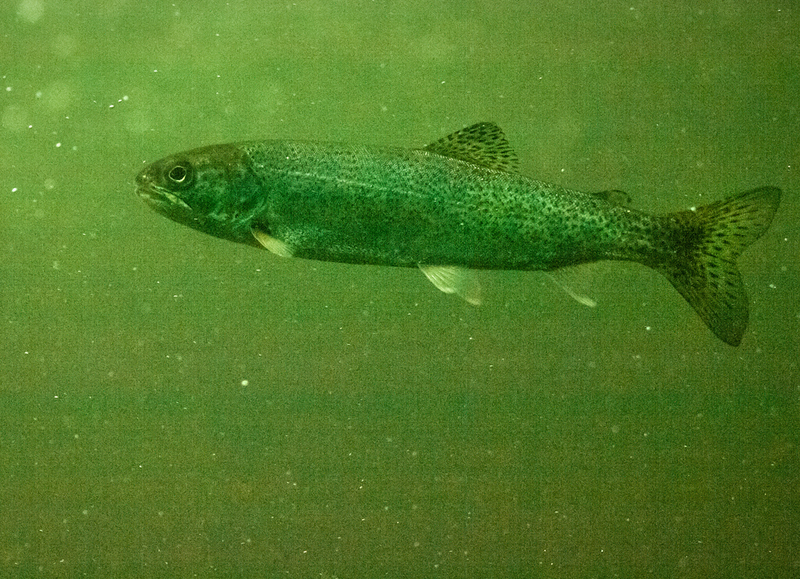 Young Chinook are using the restored marshes, and seem to be eating and growing almost as well as Chinook in more pristine areas [update: read peer-reviewed results in the Transactions of the American Fisheries Society]. 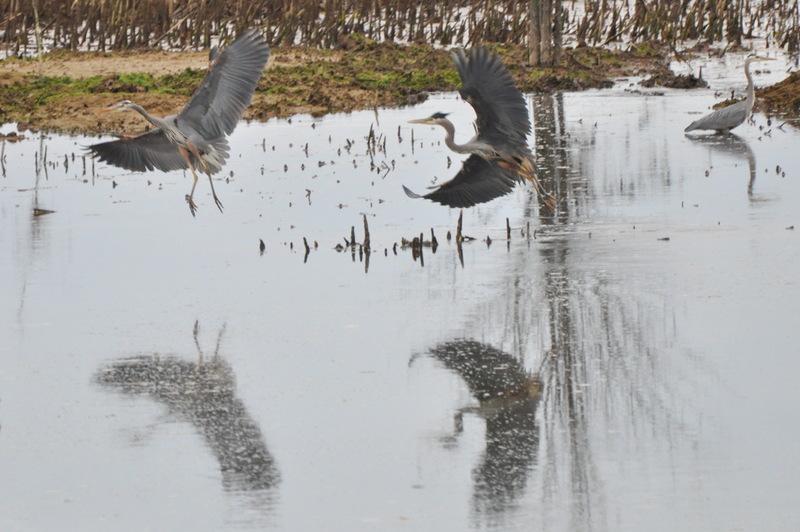 Less than a decade after the Nisqually dikes were breached, the tidal wetlands there have regained a lot of their biological function—though they still have a ways to go. Overall, scientists are discovering that life-history diversity translates into different potential reasons for population decline: Some salmon populations lack sufficient or high-quality food during early growth stages, others have specific water temperature or flow requirements. These same scientists emphasize the importance of devising restoration strategies based on the specific life history needs of the population in question to ensure a better return on our restoration investments. 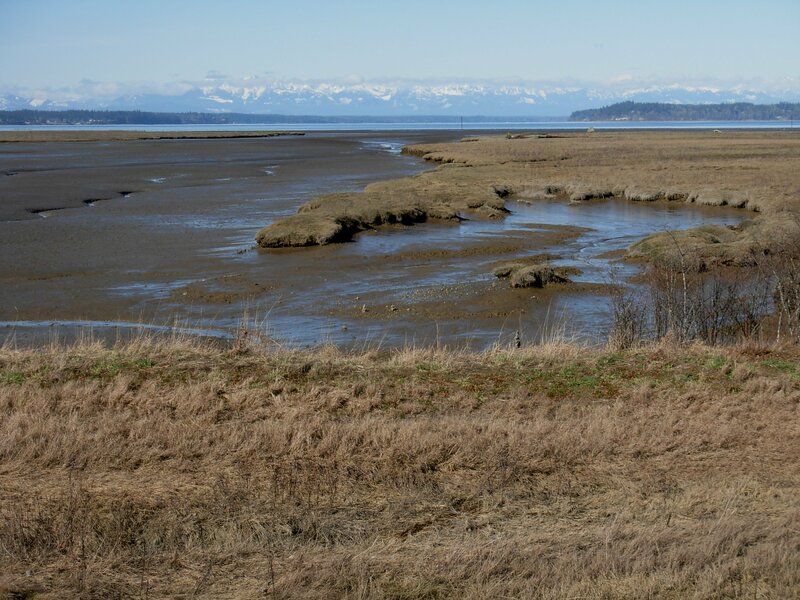 Says Thompson: “Restoration efforts usually fail or end in unquantified performance because the proper goal was not identified at the start.” In the Nisqually Delta, restoring critical salt marsh habitat might be working for the Chinook salmon that rear there. Recovering salmon populations across the Salish Sea, however, will likely require solutions as diverse as the fish themselves, researchers say. And a focus on young salmon’s earliest experiences could be the key. 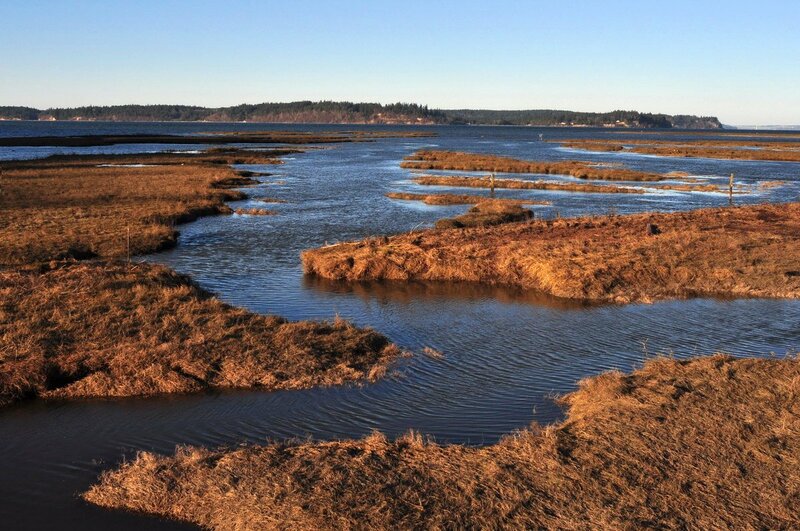 Like many wetland areas in the United States, Puget Sound’s freshwater and tidal marshes are threatened by human development. 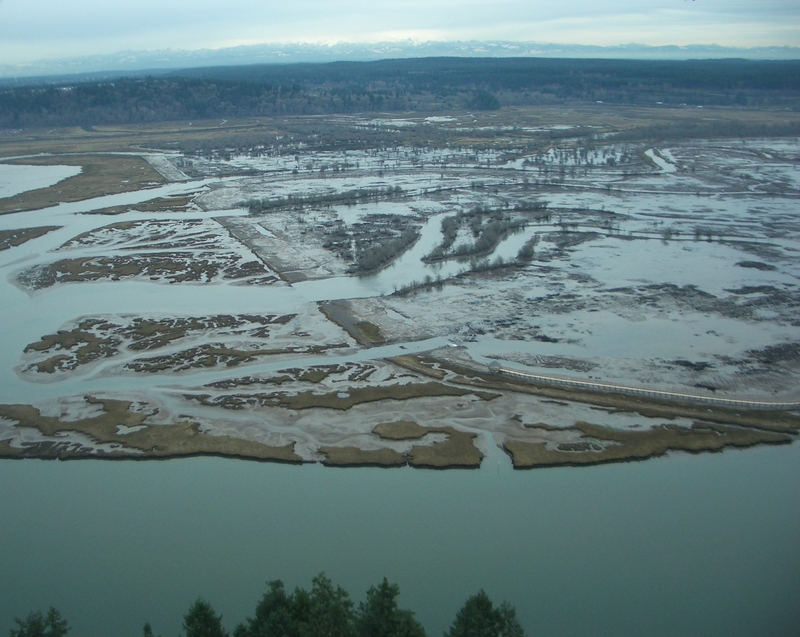 The U. S. Geological Survey (USGS) estimates that river or stream valley bottoms cover about 5% of the Puget Sound basin, but are the site of 30% of highly developed urban areas and 70% of cultivated land. 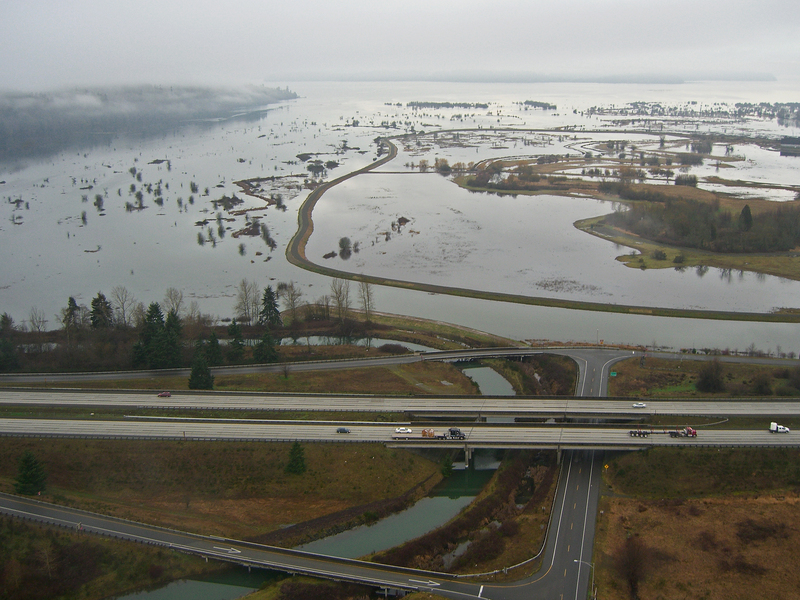 Floodplains and deltas are not the only environments under pressure: Most of the streams best suited for coho salmon rearing, for example, are located in developed lowlands, where they are prone to "urban stream syndrome." Its symptoms: Lower water quality, loss of streamside vegetation and altered food-webs, simplified stream channels, changed stream flows, and warmer temperatures, all of which have consequences for salmon. Findings presented at the Salish Sea Ecosystem Conference further illustrate the problem: Puget Sound streams converted from forest to urban land uses between 1984 and 2001 experienced a 75% decline in coho salmon abundance, relative to streams in watersheds that remained forested, according to Robert Bilby of Weyerhaeuser and others. Their studies showed that urbanized land cover at the impacted sites increased by 14%. Projections by University of Washington professor Marina Alberti and researcher Dan Miller show that 60% of high-quality coho streams in central Puget Sound watersheds will be developed by 2050. Emily Davis is pursuing a master's degree at the University of Washington School of Aquatic and Fishery Sciences. Her research focuses on how disturbances like wildfires affect stream ecosystems. When not splashing around in creeks for her research, she dabbles in her other interests of science communication and outreach.